The Edvince product pipeline is based on 20 years of research under the leadership of Professor Lars Edvinsson, conducted at Lund University in Sweden and at Glostrup Research Park in Copenhagen, Denmark. The story begins even earlier, at about the time the endothelin molecule was discovered in 1988. Endothelin is a peptide produced in the vascular walls and secreted in response to various events, such as a change in the blood flow of a vessel. When endothelin binds to receptors in the smooth muscle of the vascular wall it acts as a signal to these muscle cells to constrict the blood vessel. Both endothelin A and endothelin B receptors may be present, where the normal function of A is to effect vasoconstriction and of B is to effect vasodilation. Shortly after the discovery of endothelin, Lars Edvinsson and his research team began to study how this peptide affects the blood vessels of the brain and what implications it may have with respect to various injuries and diseases, such as stroke. One focus of study for the research team was human blood vessels obtained from patients who had undergone brain surgery, especially blood vessels from stroke patients. The usual approach had been for researchers to carefully isolate blood vessels from other tissues and on the following day study how they behave in response to the addition of various vasoconstricting and vasodilating substances. Then one day a student happened to forget a bowl containing a blood vessel on the laboratory counter. The sample was supposed to have been stored in the refrigerator, but had now been left at room temperature, which is an environment more closely approximating that found in the body. Although the researchers thought the sample was ruined, they were curious and decided to study it anyway. To their great surprise, they found that the addition of substances that would normally cause vasodilation instead had a potent vasoconstricting effect. Indeed, the sample had acquired completely new properties. These new properties may be crucial for the damaging chain of events accompanying stroke progression. This discovery became the first step of a research journey ultimately culminating in the Edvince pipeline. What had happened in the vessel that had been forgotten and left at room temperature was a cascade reaction within the muscle tissue that caused the vessel to constrict more and more. One of the discoveries was that endothelin receptor B, which is normally found in the endothelium and which when activated sends out vasodilation signals to the smooth muscle around blood vessels, now appeared more and more frequently within the smooth muscle tissue as well. Moreover, they now displayed a different signaling behavior and had no longer a vasodilating effect, but instead caused constriction. After elucidating this and several other reactions, the research team began to understand why the blood vessels changed and how these changes compromise the availability of oxygen and nutrients to brain tissue after a stroke. This is a key component for understanding disease progression and how damage to the brain occurs. After elucidating this and several other reactions, the research team began to understand why the blood vessels changed and how these changes compromise the availability of oxygen and nutrients to brain tissue after a stroke. This is a key component for understanding disease progression and how damage to the brain occurs. By clarifying the biochemical and molecular biological course of events in vascular muscle, the research team also illuminated the primary mechanisms responsible for progression of injury after a stroke which must be countered to facilitate recovery and avoid sequelae. Edvince has submitted a patent application for the results of these studies. The company currently has patents granted in the US and Europe and it is actively working on follow-on patent applications. Edvince has developed a drug candidate, Edv2209, which will undergo clinical testing for treatment of strokes associated with subarachnoid hemorrhage (SAH). The mode of action of this drug is to stop the biochemical reactions that lead to blood vessel constriction in the aftermath of a stroke. The company is also involved in a preclinical research program to develop drug candidates to prevent the kind of damage resulting from stroke caused by blood clots or cardiac arrest. 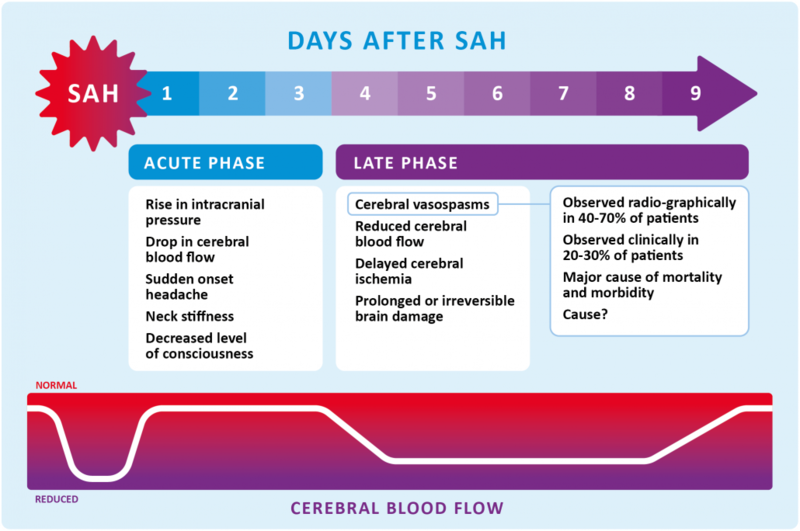 When a subarachnoid hemorrhage occurs the patient develops a severe headache and in some cases lose consciousness due to increased intracranial pressure. This elevation in pressure severely reduces cerebral blood flow. Treating patients during the first 24 hours by relieving pressure with an external ventricular/lumbar drain and intensive care may partially restore blood flow, but after an additional day or two, the patient’s condition may suddenly worsen due to vasospasm, which again reduces intracranial blood flow. Edv2209 has been developed to prevent this latter scenario, which often causes prolonged and sometimes lifelong injury to the brain. When injury first occurs the cerebral blood flow falls and the shear stress on the blood vessel walls decreases. This mechanical change is registered by integrin and other mechanoreceptors which in turn activates FAK (focal adhesion kinase) in the smooth muscle cells surrounding the blood vessels. FAK activates the ras/raf/MEK/ERK pathway which causes an upregulation of the endothelin A and endothelin B (ETAB) receptors as well as , angiotensin I and 5-hydroxytryptamine 1B receptors (5HT1B). This upregulation occurs via phosphorylation of the MAPK signaling pathway. After some additional time, the same signaling pathway also initiates secretion of substances that increase inflammation and leakage across the blood brain barrier. 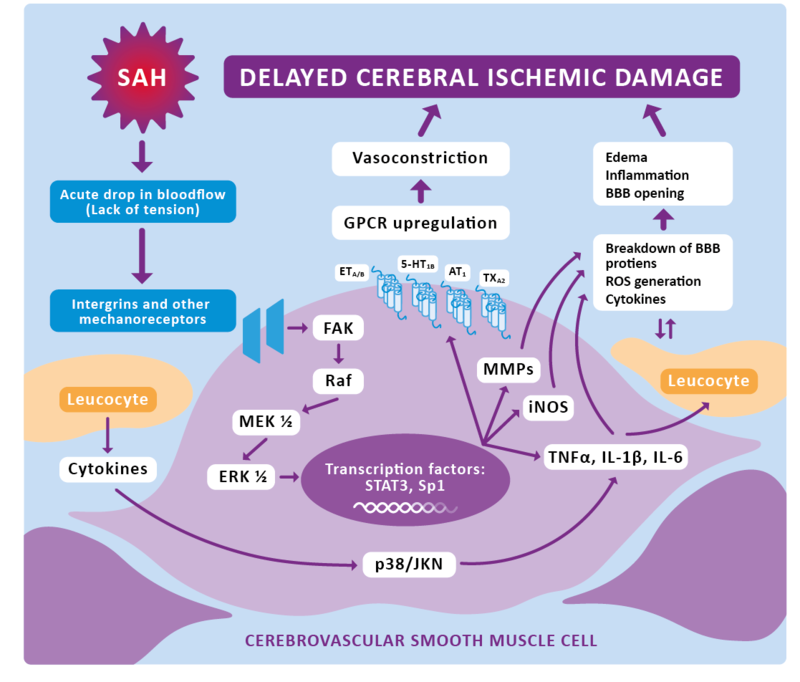 More specifically SAH induces activation of the RAf/MEK/ERK pathway which may serve as a “switch-on” mechanism leading to receptor upregulation and an increased expression of cytokinases and metalloproteinases. Edv2209 is an inhibitor of this RAF/MEK/ERK signaling pathway and is formulated for intracranial administration, where it effectively halts upregulation of the receptors and substances that lead to blood vessel constriction, a delayed cerebral ischemia and vasospasm. For more information, please see the references below.